Haircare can be a tricky thing in summer - my hair is naturally prone to frizz and the humidity of the summer months doesn't help! I have four products that I use on repeat that help to tame the frizz, hold my style and that don't weigh my hair down. Ouai Smooth Spray: A few sprays of this after washing and conditioning my hair and it's so much easier to detangle. The bonus of this product is that it also tames frizz but it doesn't weigh my hair down at all. I know that I can depend on it to make my hair smooth and sleek and it also strengthens so I have less breakage and damage overall. Kérastase L'Incroyable Blow Dry Cream: This is my go-to product to ensure that my style lasts util I next wash my hair. If I go to the effort of styling my hair - either straight or wavy, I want it to last and with this product, I am guaranteed that. It isn't heavy or greasy and is the best styling product of this type that I have used. 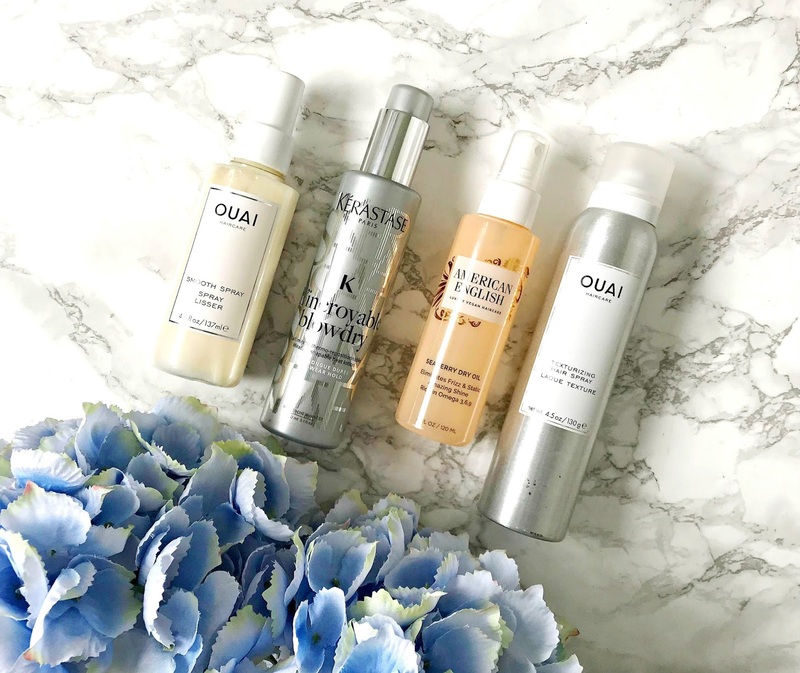 Ouai Texturizing Hair Spray: When I put some waves in my hair, I always finish with this spray because it gives it a slightly messy look that I love and also adds some volume. I also like to use it on second day hair when it has been blow-dried straight to add some movement. It doesn't make my hair feel gritty or loaded with product - it just adds texture and hold. American English Seaberry Dry Oil: Finally, I like to spray some of this dry oil into my palms and run it over my hair lengths to add some shine. This is perfect for taming split ends and generally making my hair glossy but without the heavy feeling that some oils give and only a tiny amount is needed so this bottle will last an eternity! Use the code BBUKPRO25 to receive 25% off here. Have you used any of these products? What are your hair styling heroes? I'd love to hear! All products are bought by me, unless otherwise stated. The Ouai Texturising Hair Spray and American English Dry Oil were kindly sent to me. Opinion is always my own.